Try this delicious and easy one-pan chicken dinner for any night of the week. 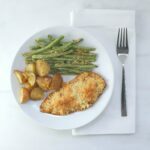 Wholesome with a lean piece of flavourful chicken breast, parmesan crusted green beans and crispy and soft potatoes. This meal is always a home run. Line sheet pan with tinfoil. Trim the tips off the green beans. Marinate chicken with "house blend" of spices. Spritz the chicken with Bragg's amino acids and combine until all chicken breasts are covered. You can do this overnight, 1-2 hours, or if pressed for time, 20 minutes. Place green beans on the left side of the pan and flatten. Place potatoes on the right side of the pan and flatten. Next, place the chicken breasts in the center of the pan. Drizzle olive oil on veggies and chicken. Sprinkle green beans and potatoes with house blend of spices. Lightly mix veggies with your hands until they are coated. Add minced garlic to the top of the chicken breasts. Use as much or as little as you'd like. We used TONS because we love garlic but, add garlic to taste. Top chicken breasts with parmesan cheese. Sprinkle veggies and potatoes with parmesan cheese. Place sheet pan into oven and cook for about 30-35 minutes or until veggies are crispy and chicken is cooked through.